A good friend of mine in the UK has just left the big manufacturing company he's been with for over 15 years and is now facing the Herculean task of quickly building and establishing his own identity. Two key starting points - a new email address (he had a personal Hotmail account but everyone knows him from his business email) and a new mobile phone number (he didn't get the option to take over his current phone number and continue maintaining the account himself). Creating a new presence is not that difficult. However, ensuring that all the contacts you've made and built up over the years know how and where to find you without interruption will be tricky. This friend is taking three months or so to adjust to the change he's embarking on (a voluntary change, I would add, not because of an acquisition or being axed), during which time I expect he'll get his new presence started. Perhaps as recently as the turn of the century you could manage a situation like this without much worry. And in a couple of months, you'd be out there again in touch with your business contacts and acquaintances as you get your new venture going, letting them know about your new email address, phone number, website, etc. Today you don't have that luxury of time. If you're not ready to transition into a new way of working immediately, you will disappear off the radar screens of many of the people and businesses you need to maintain continuity with. This applies whether you're starting out on your own or changing jobs to continue as a paid employee of a company. The workforce now is mobile and temporary even if you have a salaried job. You need to be in control of the center of communications: you. Otherwise your contacts and the relationships you build can be severed when you leave a job, and that is an investment that you have a right to maintain--as does your employer. Because otherwise, you will be stuck in a job that makes you sick just to keep the health insurance. This allows you to negotiate the same kind of stock compensation while allowing you to keep your business costs, even the ones you can't get compensated for at work, on your own taxes while increasing the flexibility you have as a working person. This prevents lock-in to a job through access to technology. Sure, you may have to work with a less impressive laptop, but you're also forced to think more like the people who really buy computers, software, services and so forth. Sound advice and well worth heeding. In this new age of global inter-connectivity, linking and influence, a blog is a prerequisite if you want to build your own credibility, be found easily and connect with others. Forget the static website. Forget the fancy brochure. Do a blog. It works - I speak from personal experience. However you actively use these or not, they can help establish your individual credibility and provide avenues of contact with others for mutual benefit. If you're career searching, you know how crucial a well-prepared CV/résumé is. You've probably read various guides on how to prepare it, what format it should be, layout, use of typefaces, how many pages, etc. For instance, take a look at the résumés/cover letters section in the Wall Street Journal's Executive Career Site - links galore to useful information that will help you. One thing you've probably heard about, too, is what happens to your CV when you send it off with an application for a job. The rules have changed now, according to The Sovren Group, who make specialist software that intelligently reads CVs (what they call a 'résumé parser'). Your CV will be read by résumé-parsing software before it ever gets in front of a human being, especially if you apply for a position with a large company who frequently recruits, or if you go via a recruitment consultant or headhunter. Traditional thinking about content and presentation will do you little good in the face of cold logic from a computer program. So you need to know how to prepare an electronically-readable CV. It's not as complex as you might think, as long as you know how. And Sovren has put together a helpful and free 7-page guide that explains how to do it. Download Tips for Electronic Resumes (requires Microsoft Word). Once you have your electronically-readable CV ready, Sovren offers a pay-for service where you can test it on actual job board processing software and see exactly what it "sees" before you post it to the job boards, recruiters, etc. After you see the results, you can revise your CV and re-test it until it's just right. News yesterday that Mark Jen, a Google employee, had been fired for blogging serves to add yet more focus to a matter that has become increasingly important to companies and employees alike - establishing clear guidelines on blogging in the workplace. This subject is beginning to sound like an auto-repeat CD (yes, I have moved on from the 'stuck record' analogy), but it is a subject on which many people have commented in past months, me included, and continue to comment. For opinions about Jen's doocing, take a look at the volume of posts that Technorati is listing. The trouble is, most of these blog posts are emotional and hardly balanced or factual, with wildy differing accounts of what happened, and many decrying Google for stopping an employee's "right to blog." Then look at Jen's blog and see for yourself what he has posted since he started working for Google last month. The blog was last updated on 27 January. Look at his brief post the previous day entitled Oops - a sure sign that he must have known he was making some people at his new employer not too happy. John Batelle, entrepreneur, journalist and author: "This is a clear message to Google employees. I imagine any who are blogging, are re-reading their HR policies about now... I guess someone who violates the rules like this will, I imagine, be dealt with in various ways by various companies. I wonder what Yahoo might have done in the same situation, or Microsoft? The information on the site, which was taken down and then redacted, was really not that big a deal. At least, it seems that way to me. But one never knows. Is this such a clear case of violation as to merit firing? Perhaps he left on his own accord, we may never know as I imagine he signed something on his way out the door." Jeremy Zawodny, Yahoo (who said he spoke to Mark Jen): "Yes, he was fired from Google. It was directly related to his blog. He was employed there for just a couple of weeks. Mark's a good guy. He doesn't believe he was doing anything wrong (neither do I based on what he told me)." Robert Scoble, Microsoft (who said he had an email from Mark Jen): "Reading Mark's blog I can see a variety of mistakes he made. When you start at a new company you need to build a relationship network before you start discussing the company in public. You need to understand what the various forces that have power (and, at every company there are probably people who have more power than you do -- even the CEO has to listen to the board of directors and to other people inside the company) and you have to work carefully and deliberately. It's not easy writing in public. All it takes is one paragraph to lose credibility, have people laugh at you, get you sued, create a PR firestorm, or get your boss mad at you. Think about that one for a while. Just a few hundred pixels on the screen can dramatically change what people think about you." > Employees - Use your own common sense on what you say about your employer and issues in your workplace in your public blog. The responsibility for this is yours, as are the consequences if you don't use your common sense. So what about the employer? Where do they stand? I'm not speaking about Google and this situation in particular: this is about any employer today. > Employers - You must establish the framework under which employees can blog in their workplace, creating the guidelines that make it clear what the ground rules are, and then communicating them to your employees in a way that they clearly understand. The responsibility for this is yours, as are the consequences if you don't have clear guidelines. Both of these 'lessons' go hand in hand - you can't have one without the other. Michael Gartenberg, research director at Jupiter Research: "We'll probably never know the full story behind these events so it's silly to speculate on what was the straw that broke that camel's back but it's clear that unless you have a VERY tolerant employer and boss, be careful what you put out there for the world to see. Having said that, it's more important than ever for every company to have a clear policy on blogging and what is and what is not acceptable. While common sense should rule, it's clearly not in all cases and it's best for everyone to be on the same page early on, if for no other reason, to stop the rumor mills from churning every time something like this happens." A high-profile business blogger, Jeremy authors the Ensight blog and is now focused on building his new venture, Inside Blogging. 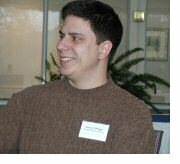 He gained signficant blogosphere and media attention in recent months related to his being auctioned on eBay, being fired by his employer for blogging and his plans for starting a book on business blogging. In this show, listen to Jeremy's thoughts and views about his book, his new venture (with Darren Barefoot) and about being dooced for blogging. If you have comments or questions about this show, or suggestions for our future shows, email us at comments@forimmediaterelease.biz. You can email your comments, questions and suggestions as MP3 file attachments, if you wish (max. 5Mb attachment, please!). We’ll be happy to see how we can include your audio contribution in a show. After a team of in-house creatives was displaced following Oracle's acquisition of PeopleSoft, the group turned to eBay to try and find work, a report by Fast Company says. Not as individual job seekers, however, but as a complete team. Take advantage of recent merger and acquisition activity in the technology sector. Their loss, your gain. An award-winning, clear-thinking, bottom-line-focused creative services organization is now immediately available to rock your bottom line. We are a creative team that's ready to plug and play. Today. A great example of different thinking, when you do whatever it takes to find a way to earn your living. Related: hundreds of displaced PeopleSoft employees have signed up to LinkedIn, the business-social network, in recent weeks. See PeopleSoft employee David Sohigan's blog for details and other information helpful to PeopleSoft ex-employees looking for work. It's time for PeopleSoft customers and employees to start thinking about the future and about protecting their own interests, because nobody else is going to be watching out for them, says an eWeek report. Benevolent or paternalistic aren't words that have ever been seriously associated with Oracle or with its founder and CEO, Larry Ellison. Business is business, and now that PeopleSoft is about to disappear into Oracle's labyrinthine halls, everybody is going to have to cut the best deal that they can. So, to all PeopleSoft employees, that means taking a close look at your role at PeopleSoft and soberly considering whether there will be a place for you in the new organization. Wise advice. My experience in working for an enterprise software company that was acquired in mid 2004 was similar - you need to be brutally realistic as you observe what's going on (and, indeed, what's not going on) during the lead-up to the deal being announced, what shots the acquiring company are calling, more so in the period in between the announcement and when the transaction is actually completed. When it comes to cutting a deal, you've got two clear options - what you want if you continue with the new company, and what you want if you leave. While you may decide to make some compromises, don't accept any that you (and your family) can't live with. Often, the best career moves happen in times of considerable workplace uncertainty and radical change. We had a few emails following this blog's conversation with Ned Lundquist about IABC accreditation earlier this month. Most of them were wondering what warm beer and a vintage MGB had to do with it. So Ned and I got together again in cyberspace to demonstrate how effective we are at clear communication. Ned, I hear that one of the big obstacles to becoming accredited is not liking warm beer. No, you got that wrong. What I wanted you to think I said which is what I meant was that, while you and I may have our cultural differences, as business communicators we share some universal truths wherever we live, wherever we work. So, becoming accredited is meeting a global standard, not just some local or industry-specific standard? You catch on quickly, don't you. Yes, I'm quite a fast learner. So, what's the biggest obstacle? For such a fast learner I'm surprised you haven't figured it out already. I'll take that as a clue. It's time, then? Time? Oh, you mean the fact that you need to be "in the business" for at least five years? That kind of "time?" No, I wasn't really thinking of that, although it would preclude a brand new professional starting out from becoming accredited, wouldn't it? For business communicators, IABC accreditation is an effective way to benchmark yourself against a set of proven standards. I wrote a commentary in this blog a few weeks ago on my own beliefs in the value of this excellent professional development programme. My blog post is just one particular message, though. What do you really know about the IABC accreditation programme? What are the requirements? What help can you get to prepare? And how do we get the story out to more communicators? Ned, I understand you are the marketing director for IABC's International Accreditation Board. Is that right. Does that mean that you are selling accreditation? I'm not selling accreditation, but I am promoting the value of becoming accredited, and the value of the process through which one becomes accredited. You are an American. Is the IABC accreditation program geared towards Americans? Neville, you and I speak the same language, and our ancestors received spiritual guidance at Stonehenge, or plundered some villages near there. But you drink your beer warm and drive on the wrong side of the road. Does that mean you are not a good communicator? Accreditation through IABC means that you have met a global standard. Not a Washington, D.C. standard (actually Washington has no standards), or a North American standard, but a universal standard. We agree on the basic fundamentals of good business communications are universal truths. That's the standard we use. Undergoing the scrutiny and passing the portfolio and the exam means you have met that global standard. Even more, it's a personal statement about yourself. You don't like warm beer? I have an MGB, Neville, and I'll never forgive the UK for that damn electrical system, but when it comes to understanding our messages, key constituencies, having some useful research and analysis and basing our measurable objectives upon that research, and creating a sensible plan and executing it in a professional manner, and evaluating our results against the measurable objectives, well, that's something we do, or should do everywhere. You mentioned measurable objectives, do you have measurable objectives for the IABC accreditation program? I sure do. I want to double the number of ABCs [accredited business communicators] in 2005. Then I want to double that number again in 2006. That means each ABC needs to be personally responsible for bringing in one new ABC next year, and just one more the year after. My goal is 2006 by 2006. Ned, does direct marketing figure into your plans? Absolutely. Each ABC needs to reach out and touch someone they know and believe is a good communicator and encourage them to undertake this process. That's pretty direct. Do you think a lot of our fellow communicators can pass the test? I most certainly do. Beyond the fact that the test is a very fair assessment of one's experience, knowledge and expertise, I feel strongly that most communicators with at least five years in the business have already accomplished the kind of work needed for a portfolio and could pass the test if we administered it right here and now. But there are all kinds of resources to help you, like mentors, workshops and funshops to guide your way, and some helpful publications. But the test isn't based on some body of knowledge. It's based on what you should already know. You are the body of knowledge. That's quite a stirring image, Ned, that body of knowledge. Your body, not mine. But take it from me, a guy who isn't the brightest bulb in the marquis. If I can do it, so can you, and your fellow communicators. I should mention that passing your ABC doesn't require that you demonstrate that you are the best communicator, you just have to show that you are a good, solid communicator. Thanks, Ned. Care for an ice-cold Heineken? Ned Lundquist, ABC, is Director of Corporate Communications for the Center for Security Strategies and Operations at Anteon Corporation of Fairfax, Virginia, USA. In addition to his wide-ranging IABC volunteersim activities, Ned is creator of JOTW, the email newsletter community for communicators who are seeking jobs and/or have jobs to offer. Written about in the Wall Street Journal and Fast Company (see my post in August), JOTW now has over 7,500 subscribers. I had an email last week from my professional association, IABC (International Association of Business Communicators), with an update on what’s happening with the association’s accreditation programme. A great deal, actually, which has given me cause to reflect on what a superb professional development opportunity accreditation is. The formal description of the programme says accreditation offers communicators a way of demonstrating to employers, fellow communicators and themselves their ability to successfully manage and perform those tasks essential to effective organizational communication. When I took the accreditation examination 10 years ago, I saw it as a perfect way to benchmark myself against a set of proven standards. When you pass the exam, you are then known as an accredited business communicator and can use the designator ‘ABC.’ And re this, one of the news item in last week’s email announced that, for the first time, IABC has introduced a special logo that accredited members are entitled to use on business cards, brochures, websites and other materials. I’ve now proudly got mine on my profile page. I’ve never regretted taking part in the accreditation process. And process is probably a good word – accreditation is no simple undertaking, involving as it does the preparation of a portfolio to demonstrate how well you understand the principles and practice of communication planning, execution and measurement, followed by a written and oral examination, all of which is judged by your peers. I’ve also been an accreditation examiner myself. To get an idea of what the written and oral exams entail, take a look at the sample exams. I believe IABC’s accreditation programme for communicators is unmatched by any other professional association. And there are other programmes, of course, that are tailored to specific disciplines. So, in the US, you have the APR qualification if you’re a member of the PRSA. In the UK, there are programmes run by the Chartered Institute of Marketing and the Institute of Public Relations, for example. Associations in other countries have their own professional development programmes. The difference with IABC’s programme is that it enables you to secure a recognized professional qualification that isn’t limited to demonstrating your knowledge and abilities in purely one or just a few areas of organizational communication. It’s ideal if your career has embraced the wide spectrum of organizational communication – PR, employee communication, corporate communication, investor relations, and so forth. Indeed, if you have had lots of experience but focused in only one or perhaps two areas, it’s unlikely you would be able to meet the requirements for taking accreditation. I give a call to every IABC member who hasn’t yet taken the route to accreditation to consider it, either for the first time or again. You will never regret it. And here’s your opportunity to find out more about becoming an ABC – participate in Getting Accredited in 2005: Developing Your Portfolio, IABC’s first teleseminar on accreditation taking place on 19 January 2005. So, in sum, accreditation helps you judge whether you really do know what you think you do, and how effective you are at doing what you do. That’s it’s true value. Via A Penny For... comes an extremely interesting story of how Bzzagent, a word-of-mouth marketing network in North America, proactively used their public blog to discuss their needs for hiring a particular new senior employee, and then posted commentary about the two short-listed candidates asking for comment and opinion on which one to hire. A very bold example of being wholly open and transparent in recruiting. A sign of the near future.